Is it a legacy of the Wild West or something perfectly justified in the light of the USS Cole – let the reader be the judge. 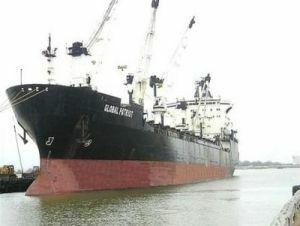 A US Ro-Lo cargo ship on charter to the US Navy, Global Patriot opened fire on a small boat approaching it in the Suez Canal this week, leaving at least one man dead and two others injured. Reports from the American ship claimed that attempts to turn away several approaching boats with warnings were ignored and when one boat continued on its course towards the American freighter shots were fired in the direction of the small boat, with at least the one fatality. Apparently the Global Patriot was carrying a small navy security team which did the actual shooting. According to an Egyptian spokesman small boats frequently follows ships in the canal to sell cigarettes and other small items. Known the world over as bumboats they know better than to approach military ships in this day and age but in this case the vessel appeared to be a civilian freighter.